Beginning June 18 and ending June 22, Old Pacific Highway will be closed for road repairs between UNeek RV and approximately ½ mile to the South. The road work will repair a section of Old Pacific Highway that has settled as a result of land movement. Nutter Corp. will complete the work under contract with the City of Kelso. During the road closure, traffic will be detoured around the closure via Kalama River Road and I-5. Following the five day closure, the road will be open, but single lane closures will be necessary for up to a week to allow for completion of guardrail replacement and restoration work along the edge of the road. While single lane closures are in place, traffic will be flagged through the work area. Delays should be expected. Construction will be completed by June 29, 2018. If you have questions about the project, contact Paul Klope, 360-577-3322. Updates will be posted on the City’s webpage and Facebook page. June 7, 2018 at 5:30 p.m. in the Cowlitz County Administration Building - General Meeting Room, 3rd Floor, 207 4th Avenue North, Kelso. File your Business License Application online. The City of Kelso partners with the state Business Licensing Service to support its city license program. Businesses get convenient online registration and renewal services connected to other Washington cities and public agencies. Licensing helps public safety agencies to contact you in an emergency and improves resources to better support economic development in our city. Am I required to get a city business license? City businesses - companies and individuals - must obtain a city license if doing business within City limits. Using the online service is the fastest way to apply. Common carrier delivery of goods and services within city limits. Minors engaged in baby-sitting, newpaper delivery, lawn mowing, and car washing. Renew Business License on line. Work will begin Monday, May 14, to reconstruct the pavement, sewer and portions of the sidewalk and storm drain in South Pacific Avenue between Cherry Street and Vine Street. NW Construction General Contracting, Inc, Battle Ground will complete the work under contract with the City of Kelso. Construction will be completed by August 31, 2018. During the construction work, sections of South Pacific Avenue will be closed, typically two blocks at a time, and detours around the closures will be provided. No vehicular access or parking will be allowed on South Pacific Avenue in the closed blocks. Any vehicles parked in the closed sections will be towed at the owner’s expense. Transit will be rerouted on South Pacific during the project. Contact RiverCities Transit, 360-442-5663, for details. The City of Kelso’s Lodging Tax Advisory Committee will be holding a Special Meeting on Monday, March 19th at 3:00 p.m. in City Council Chambers at City Hall 203 S. Pacific Ave, Kelso, to discuss new requests for funding in the 2018 budget year. Please contact the City Manager’s office at 360-577-3301 with questions. The City of Kelso has updated the City of Kelso Park Facility Plan. 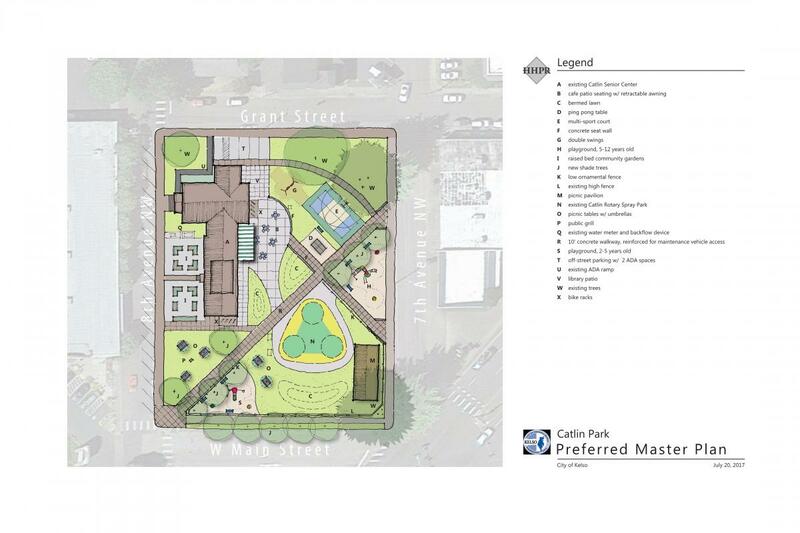 The purpose of this plan is to create a Catlin Spray Park Master Plan, prioritize improvements and opportunities within our current parks, and to identify areas lacking in parks. Consultants Stefanie Slyman and Daniel Chin with Harper Houf Peterson Righellis conducted public outreach, inventoried our current park system, and analyzed opportunities. This work was presented to the City Council at the regular Council meeting on March 6th. Before the Council will make any final decisions about adopting the plan on April 3rd , the public is invited to view the plan and comment to the City. The City of Kelso Park Facility Plan and Presentation to the Council on March 6th can be viewed here. All comments must be in writing either via email, USPS, or hand delivered to Community Development. Written comments will be taken until 5PM on March 30th. The public is invited to come and comment on the plans directly to the City Council at the regular April 3rd meeting at 6PM. If you have any questions, staff contact is Tammy Baraconi, Planning Manager. She can be contacted at tbaraconi@kelso.gov or at 360.577.3321. Cowlitz Clean Waters is proud to announce its Stormwater Video Contest for high school students. Submittal Deadline: Entries must be received at Kelso City Hall by no later than 5:00 pm on May 18, 2018. For complete rules and guidelines, application and release forms, visit the Cowlitz Clean Waters website .